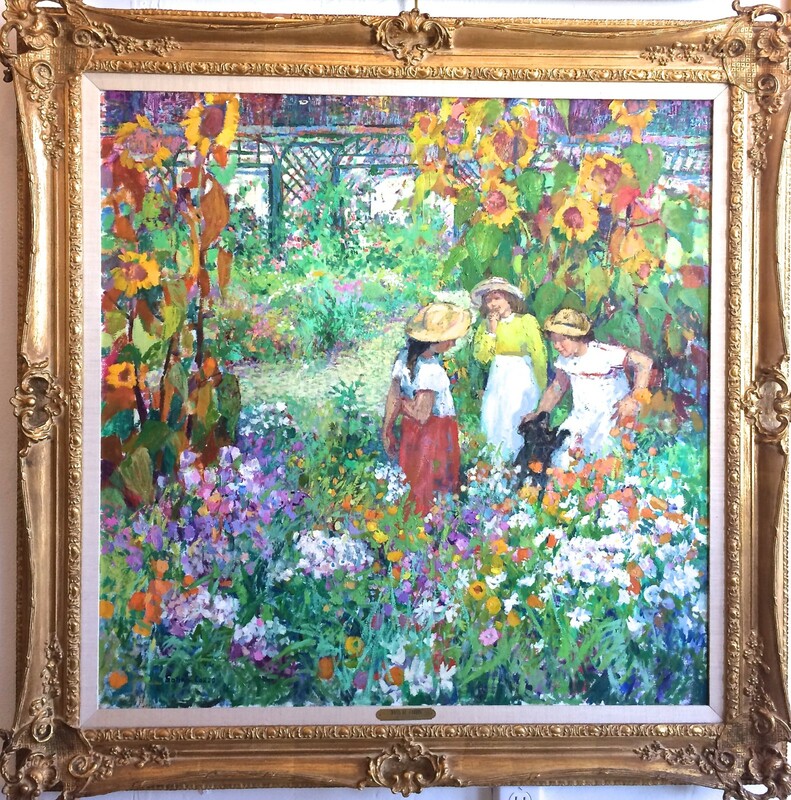 Charming oil on canvas garden scape, titled “Dans Le Jardin”, by the husband and wife team of Sotiris-Corzo. The painting is signed in the lower left corner. By juxtaposing warm and cool colors, the artist’s can capture the lightness of the scene with three children playing with their pet. 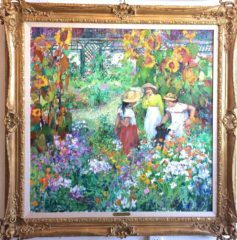 The painting is framed in an ornate golden frame. Sotiris was born in Athens, Greece in 1936. He traveled extensively in Europe studying and refining his painting. He completed undergraduate work in 1954-59 and continued his post-graduate work at the Glasgow University, Scotland, 1966-67. He came to the United States in 1968 and continued his studies at UCLA and Santa Monica College where he met Corzo. In 1969, they married. Corzo was born in Argentina in 1949, within a family of artists. Her Spanish born father, Mauro Hernandez, became the driving factor in her goal to pursue painting. She began her professional career at the early age of 15. An art major in high school, Corzo continued her studies at Santa Monica College. Their original paintings are exhibited in major galleries throughout the United States and Europe.